Marek Edelman (1919-2009) was buried in Warsaw’s Jewish Cemetery yesterday. 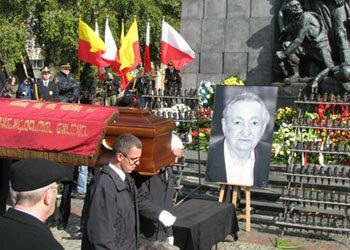 The last leader of the Warsaw Ghetto Uprising was considered to be a moral authority and an irreplaceable individual. About 2,000 people took part in the ceremony, many joining the procession spontaneously as it moved through numerous parts of the city important to its Jewish heritage, including the Heroes of the Warsaw Ghetto Statue. The ceremony, which was conducted as a military funeral, included many Jewish and Polish themes. It was attended by many prominent Poles and members of the Jewish community in Poland, including Polish President Lech Kaczyński, the former Polish Prime Minister Tadeusz Mazowiecki and former Izraeli ambassador to Poland Shevah Weiss. Mazowiecki described Edelman as a guardian of the memory of WWII, and a guardian of principles in post-communist Poland. Weiss said that Edelman was a hero of both the Polish and the Jewish nations. Edelman’s biography is extraordinary. He was born in Belarus but grew up in Warsaw. He was the last leader of the Warsaw Ghetto Uprising in 1943 and also took part in the Warsaw Uprising in 1944. After the war he became a distinguished cardiologist, and from the mid 1970s he actively supported the anti-communist opposition. He was a member of the Solidarity independent trade union from 1980 and was interned during martial law. In 1989, he took part in the round table negotiations, and was politically active afterwards. He was known for his modesty and realistic approach to life and death. He never allowed himself to be called a hero. Yet he received countless awards. In 1989 he was given a Doctorate Honoris Causa from Yale University, and in 1998 he received the Order of the White Eagle, Poland’s highest decoration. In 2008 he was awarded the French Legion of Honour. Marek Edelman passed away on 2 October at his family home in Warsaw.